Special feature by Lynne Joyce, Rochdale Observer, Saturday March 1993. A former prisoner-of-war whose real-life exploits rivaled a comic strip hero has been back to Germany for the first time in fifty years. 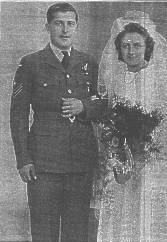 Flight-Sergeant Harry Tenny was 18 when he took part in a combined Squadron bombing raid on Berlin. His plane was shot down and three of the seven-man crew died. Harry's parachute got caught in the branches of a "dirty big tree" and he hid in a wood for three days before being taken prisoner by a member of the Volksturm (home guard). In the two years he spent in captivity he switched identity, helped to sabotage four transport barges and then escaped. Mr Tenny aged 69 of Oak Close, Shawforth returned on Monday from a five day trip to Germany with his wife, Dorothy, and daughter, Vivien. They traveled 900 miles to revisit the sites of the former prison camps he was held in, and also went to the most famous of all - Colditz. Mr Tenny had suffered a stroke in November, and Vivien persuaded him to type out the story of his exploits for her three daughters. Mr Tenny said, "She thought it would keep my brain active". When he had finished, Vivien suggested the trip. He had been unable to go back earlier because the Camps were in what became East Germany after the Second World War. Mr Tenny said, "It has been a really wonderful experience. It might sound strange but I enjoyed every moment of the war-apart from the killing of course, I didn't enjoy that at all." While in Germany he presented a map of Torgau Camp, "liberated" from the Camp Commandant's office when he was freed - to the Museum that has been opened there. Another notice he has, warning the POW that they would be shot on sight, will go to the museum later. He said, "The Russians took over the camp and filled it with Germans." They killed 8000 of the 12000 Prisoners there.